Ryan Burge, a political scientist at Eastern Illinois University and a Baptist pastor, found that 23.1% of Americans now claim no religion. 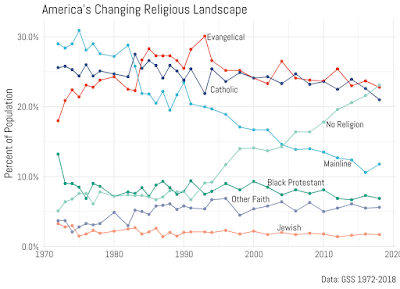 Catholics came in at 23.0%, and evangelicals were at 22.5%. The three groups remain within the margin of error of each other though, making it a statistical tie. Over 2,000 people were interviewed in person for the survey. 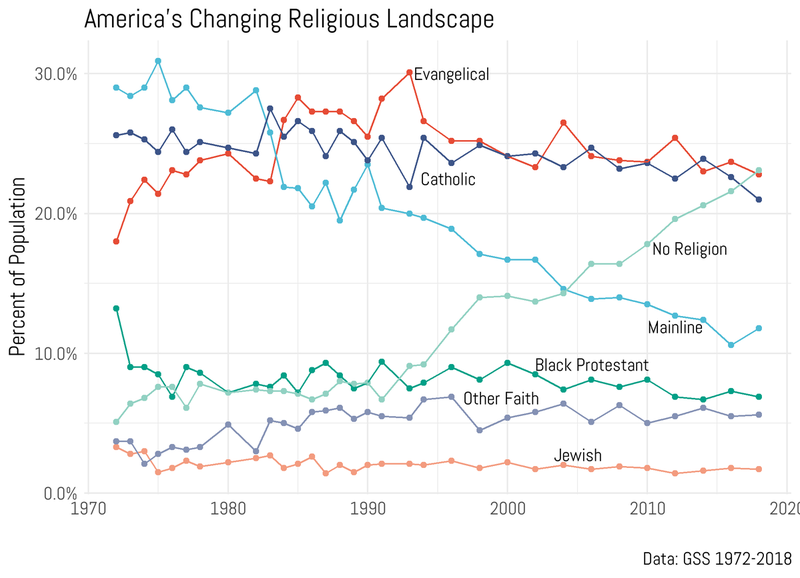 "Religious nones," as they are called by researchers, are a diverse group made up of atheists, agnostics, the spiritual, and those who are no specific organized religion in particular. A rejection of organized religion is the common thread they share. Robyn Blumner, executive director of the Richard Dawkins Foundation for Reason & Science, sees the change as a generational trend driven by millennials. "We are seeing the rise of a generation of Americans who are hungry for facts and curious about the world," she says. The Congressional Freethought Caucus's 10 members try to represent non-theist interests while protecting the secular character of government. "This growing group of Americans can feel like there is at least some people in Congress who believe they matter." says the co-chair and founder, Rep. Jared Huffman of California. Again, I hope the trend continues and that politicians are forced to stop prostituting themselves to the shrinking "religious right."